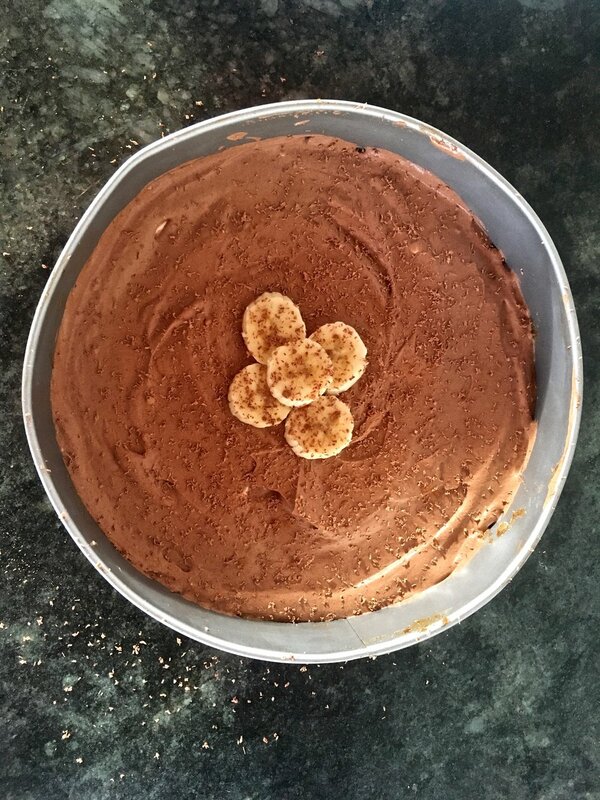 This is a wonderful rich and delicious dessert that is easily made raw. Plus it is gluten free, sugar free and completely plant based. You will need about an hour to make it and a good food processor for the best results. 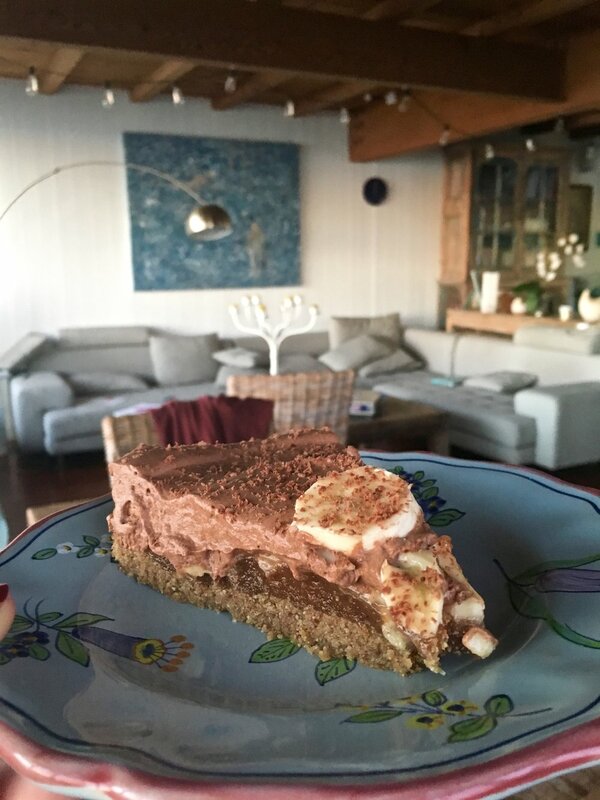 The pie is made up of 4 layers: the crust, the date caramel layer, a layer of bananas and then a layer of chocolate coconut cream. 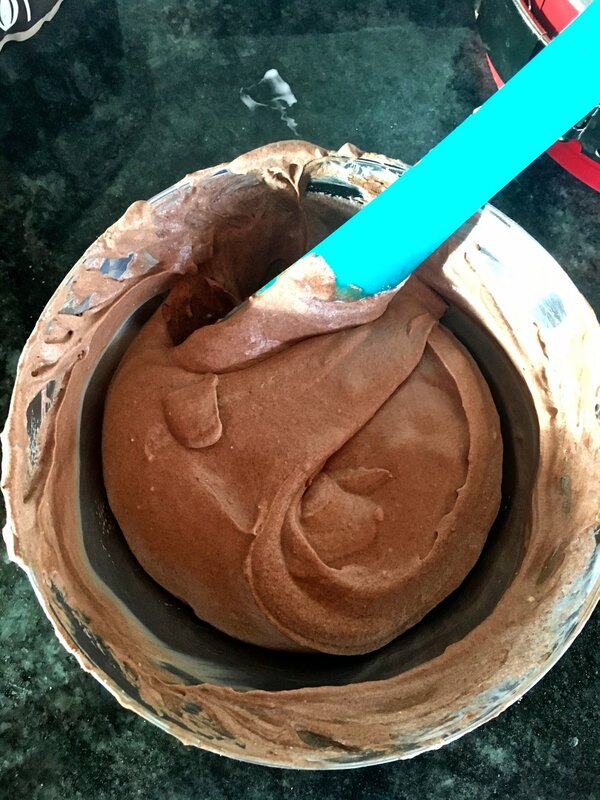 If you are using unsweetened Cocoa Powder you may want to add some sweet to the cream. To avoid using sugar you can use coconut sugar or stevia. Use a springform pan to make the pie so you can remove the sides easily. You may also want to add a piece of baking paper on the bottom so you can slide the cake off onto a plate. Start by adding the almonds, walnuts and flaxseeds to the food processor and blend until they create a course flour like substance. Add the dates, coconut oil, spices and a little flour of your choice (we used chickpea flour). Blend until the mixture becomes dough like. The mixture should hold together nicely even when placed on the counter. 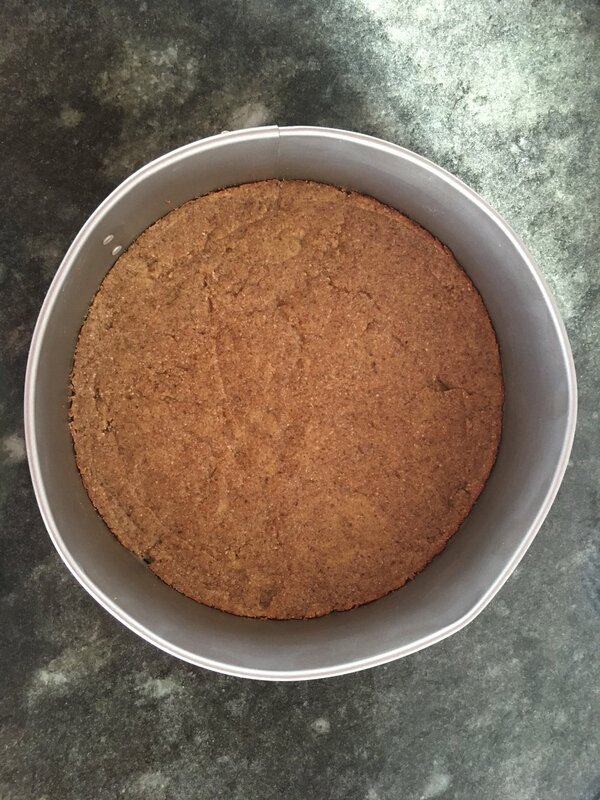 Press the dough into the cake tin and flatten it evenly with the back of a spatula. I like to flash cook this in the oven at 180 C for 5 minutes. If you would like to keep it raw let it cool and set in the fridge. Add the dates, almond butter, coconut oil and 2 tablespoons of water to your food processor and blend until it creates a paste. Blend until the dates are fully gone and add water as needed. You want it to create a beautiful caramel like consistency. Layer this onto the the base and then let it set in the fridge. If you have decided to flash cook your base make sure it is cool before you layer the caramel on. First slice 2-3 bananas and layer the cake with them, then make your coconut cream. For your coconut cream to whip you will need to let the coconut cream sit in the fridge over night and then in the freezer for the last hour. Make sure your whipping bowl and whisks are cold before you start whipping. This is an important step. If everything is at room temperature the cream will not whip effectively. Use and electric whisker to the whip the cream to a suitable thickness. Then fold in the cocoa powder and optional sweetner of choice. Layer the coconut cream onto your pie and return the pie to the fridge. Let the pie sit for a couple hours before serving. To finish up you can add a couple bananas to the top and great some chocolate to decorate. Enjoy!